Serves up soldiers, spies, politicians, reporters, and Iraqi civilians who speak almost entirely in clichés. 115 min. Universal Pictures. Director: Paul Greengrass. Cast: Matt Damon, Amy Ryan, Greg Kinnear, Antoni Corone, Nicoye Banks. Chief Warrant Officer Roy Miller could teach Sarah Palin a thing or two about “going rogue”—assuming he lives long enough to tell the tale. In 2003 Baghdad, Miller and his unit are charged with rooting out Weapons of Mass Destruction. Burned three straight times, Miller complains that he and his men have been risking their lives on bad intel. So when his team happens on some first-hand intelligence about fugitive General Al Rawi, Miller defies orders to chase down the truth about the WMDs that predicated the Iraq War. With that, action thriller Green Zone is off to the races. Those naysayers who questioned the appropriation of the Iraq War for entertainment purposes in newly minted Best Picture The Hurt Locker will have a cow over the latest collaboration of star Matt Damon and director Paul Greengrass (The Bourne Supremacy, The Bourne Ultimatum). Unlike The Hurt Locker (incidentally, also shot by cinematographer Barry Ackroyd), Green Zone shows little interest in characterization, instead assembling clunky narrative machinery that amounts to an action-packed fiction remake of Charles Ferguson’s 2007 doc No End in Sight (rather, the film cites as “inspiration” Rajiv Chandrasekaran’s 2006 non-fiction book Imperial Life in the Emerald City. In some ways, the story here—like Greengrass’ acclaimed United 93—seems “too soon” for useful perspective; in other respects, it already feels like old news. 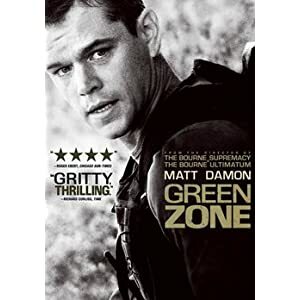 Given what we know about WMDs, how can Green Zone be anything other than two hours of anticlimax? As Miller, Damon does his best to be a sterling, steely distraction from the script’s deficiencies, but even he can’t make credible the preposterous loose cannon he’s asked to play. Audiences have already proven time and time again that they see nothing escapist in the Iraq War, so why did Greengrass go there, bringing his signature shaky cam? Presumably to get away with telling an “important” story in the guise of a popcorn picture. But Green Zone is tired and corny—not meaningful—and frantic in its action rather than genuinely exciting. Despite his ever-impressive command of mise-en-scène (best demonstrated by an opening sequence that gives us an insider perspective on the bombing of Baghdad), Greengrass deals a bad hand from his deck of Iraq War playing cards. Green Zone is a study in futility, in more ways than one. 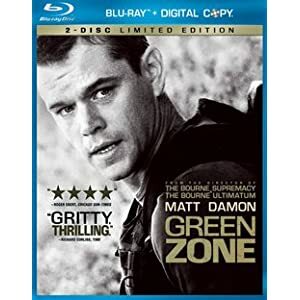 Green Zone is rough and ready in its home video debut, and especially impressive in a Blu-ray + Digital Copy special edition. The hi-def blu-ray transfer retains the film's on-the-fly look, with grain that's noticeable but never detracts, purposely bleached color scheme, and occasional noise from the handheld shaky-cam. It's all a part of realizing Paul Greengrass' vision for home screens; it's a typically impeccable Universal transfer. The immersive DTS-HD Master Audio 5.1 mix is simply awesome, packing a series of wallops into each action sequence (with the sounds of war coming from all directions) while delivering dialogue with crucial clarity. Universal's U-Control functionality includes a video commentary with director Paul Greengrass and Matt Damon, as well as a Picture-in-Picture track that includes behind-the-scenes footage and cast and crew interviews (among them Greengrass, Damon, Khalid Abdalla, Brendan Gleeson, Amy Ryan, Greg Kinnear, Jason Isaacs, and U.S. military advisor Richard L. "Monty" Gonzalez). In the commentary, Damon comes off as tired and bored, but Greengrass picks up his slack with a stream of observations about the significance of each scene. Four "Deleted Scenes" (12:27, HD) come with optional video commentary by Greengrass and Damon. "Matt Damon: Ready for Action" (9:47, HD) is the first of two making-of featurettes, this one focusing on Damon's commitment to accuracy and tough work ethic. Interviewed are Damon, Brian Siefkes, Michael Dwyer, Alexander Drum, Greengrass, Gonzalez, producer Tim Bevan, producer Lloyd Levin, Paul Karsko, Edouard H.R. Gluck, Adam Wendling, Jerry Della Salla, and Abdul Henderson. "Inside the Green Zone" (8:52, HD) gives more of an overview of the production and looks at the shooting of a sequence in which soldiers raid a home. Participants include Damon, Greengrass, Isaacs, Kinnear, Said Faraj, Siefkes, Wendling, Ryan, and Gleeson. Universal 's standard My Scenes bookmarking feature is here, the disc is D-BOX motion enabled, and there's the relatively new functionality of Pocket BLU, sending the Blu-ray experience to mobile smartphones.